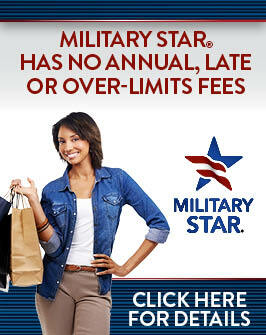 Should You Sign Up for a Military STAR Card? No. No you should not sign up for Military STAR card, ever. 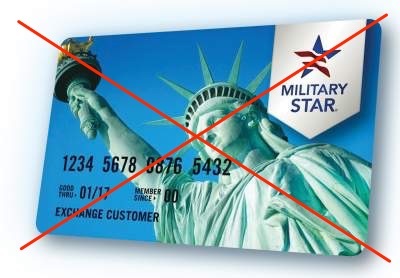 Every time I see a promotion for Military STAR card at the BX, a part of me dies inside. I was once a young Airmen shopping at the BX, naively thinking a STAR card would be ‘good for me’ and allow me to grow my credit. A year later my STAR card was maxed out, and just another bill to be paid on top of several others. Here are several reasons to avoid the STAR card. I know what you are thing… ‘I’m young and have no credit. This is a great way for me to get started.’ What do you need credit for anyway? To buy a car? Well guess what, you know who already has sufficient credit to buy a reasonable car? People in the military with a steady job and income! Local credit unions and banks such as USAA are willing to give you a car loan at a decent rate based solely on your active status in the military. So you do not need to build credit via credit cards to appear attractive as a borrower in their eyes. If everybody got a STAR card and paid it off every month, then the program would no longer exist. The reason the offer 10% off your entire first purchase just for signing up, is they know you will rack up a balance on the card and not pay it off. When you pay the minimum balance on that card, you are paying interest directly to the card company, which as of December 17, 2015 is 10.49%. According to this credit card calculator, it will cost you $10 per month and 11 years to pay off the card! That is basically $10 per month out of your budget, going nowhere! Not true. Your interest rate will increase if you pay late. That is essentially a fee. Paying a $500 balance on time will cost you around $10 per month. But if you are late on your payments, the interest rate goes up to 18.49%! It would now take you 21 years to pay off that same balance using the minimum payment. As a bonus, AAFES can contact your military leadership if you late on payments, negatively highlighting you. So the Military STAR card gives you 10% off your first purchase when signing up for the card. You can also get 5% off when purchasing gas (same as most grocery stores offer with no credit card). Say you spend $300 during that first purchase and save $30. The card company will make that money back (and you will lose that money to interest) in about six months if you do not immediately pay off the balance. Need new boots like the guy in this video? First – talk to your resource advisor and see if you can get boots through your unit. As a second option, save up the money and buy them with cash! If you have a steady paycheck and are being responsible then why is your first option to buy boots on credit? Shame on AAFES for putting military in uniform into these videos. There are lots of better options out there. If you have absolutely zero credit or something, it can get you started, but it’s really not a great card. To sum it up, you don’t need a STAR card to build your credit, the rewards program is crap, and your credit will be negatively impacted if you pay late. Stay away from Military STAR card! You sound like a complete moron.